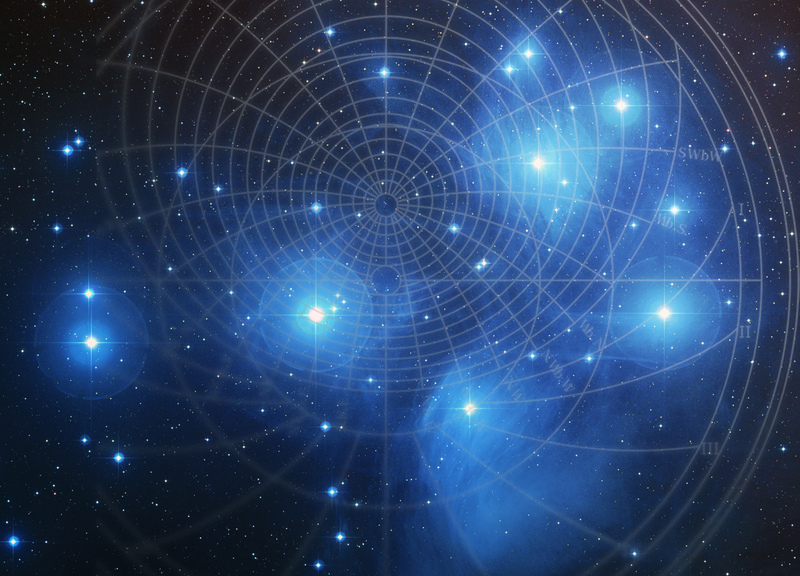 This article has previously been published by the IAM Infinity Astrological Magazine in 2018. Alex Zanardi is a famous Italian athlete. His bios is an amazing list of success, but far more importantly, at least to me, an example of how to face life challenges without giving up. I knew how to look at that what remained rather than at that what was missing. In 2002, CART honored Zanardi by giving him the privilege of waving the checkered flag in Toronto, Canada. In 2003, Zanardi was ready to take to the track again, with the aid of hand-operated brake and accelerator controls. Before the 2003 German 500, Zanardi ceremonially drove the thirteen laps he never finished at the Lausitzring in 2001. He lapped fast enough that had he been qualifying for the race that weekend, his fastest lap time would have qualified him fifth in the actual race. It persuaded Zanardi that a race return was worth pursuing. He took several wins among others Istanbul in 2006 and Brno in 2008 and 2009. At the end of the 2009 season he announced his retirement from the WTCC. His career is still going on. Zanardi has a daytime chart. Capricorn is rising and Saturn is in the 3rd house of movement, communication and short travel, opposed (by sign) by the malefic out of sect Mars, who is also the exaltation ruler of the AC. Since Saturn is retrograde, both planets are approaching reciprocally. This indicates problems (Mars) linked to the physical body (Saturn), but also links the native (Saturn) with the ruler of the MC (success). 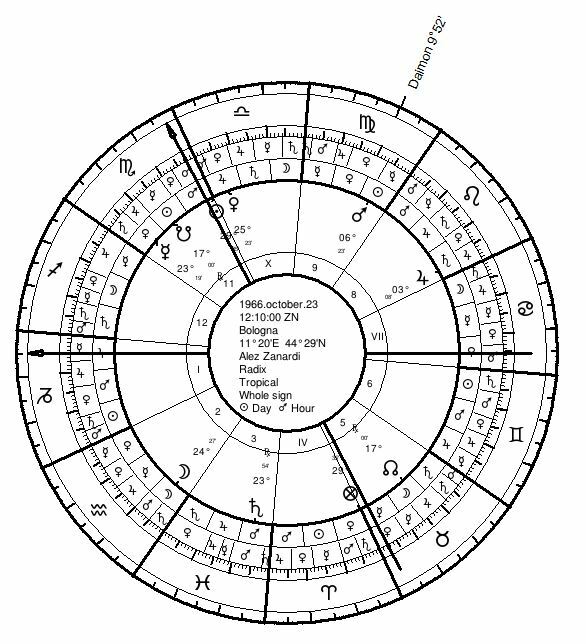 Saturn (L1, self realization) is in Pisces, a double bodied sign, which describes his life divided in two very distinct phases. This is literally confirmed by Saturn: he is retrograde: while his life goes first into one direction, at a certain point it will go in another. The luminary in sect is prominent in the 10th house close to the MC and conjunct a strong Venus (L10). She is also the triplicity ruler of the rising sign. The Sun is going to square the benefic in sect (Jupiter). These are very strong indication of success. 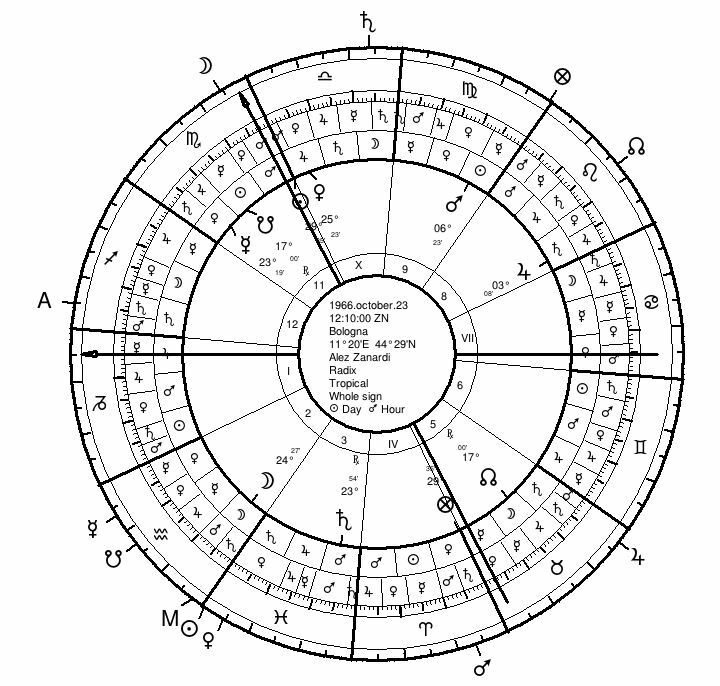 The career (MC) is squared by Jupiter, strong in his own bounds and above the horizon, but in the 8th house. Zanardi’s career requires some kind of transformation. The malefic out of sect and thus Zanardi’s oppositor is Mars in the 9th house of travel. Mars is peregrine and in a cadent house, making the planet more dangerous. He is the natural significator of accidents and rules power and engines. A racer makes a lot of kilometers with his car during every single race and thus covers long distances, even though he does so only by circling around not getting very far at the end of the race from where had started. Also, races are competed mainly in foreign countries, so Mars position in this house seems appropriate. In traditional astrology, speed is not associated with fire or any specific sign but with cadent houses/ declining places. These imply travel and thus movement. Generally, bi-corporal signs as here Virgo are associated with some kind of medium speed, not as fast as the straight cardinal signs, not as slow as the fixed signs. The speed is more pondered. Zanardi worked many years as a test driver, which expresses this earth Mars very well. He struggled much with technical problems in his “first” career, as a formula 1 and 2 driver. Although very successful, he never became the number one. He always had to struggle against technical problems (Mars, malefic out of sect, in the house of the races). However, in a race, the driver does not only need to accelerate, but needs to know when to slow down in the curves, or when to refuel, how to consume less and give more power and many other things which are very import for Zanardi. According to his chart, he was much of a technical driver rather than just an intuitive racer. Mars is in the domicile of Mercury, and Mercury is in the domicile of Mars. While his mind is tuned on competition, his adrenaline is used in a functional way. At the same time, Mars (the race) is also Zanardi’s risk. 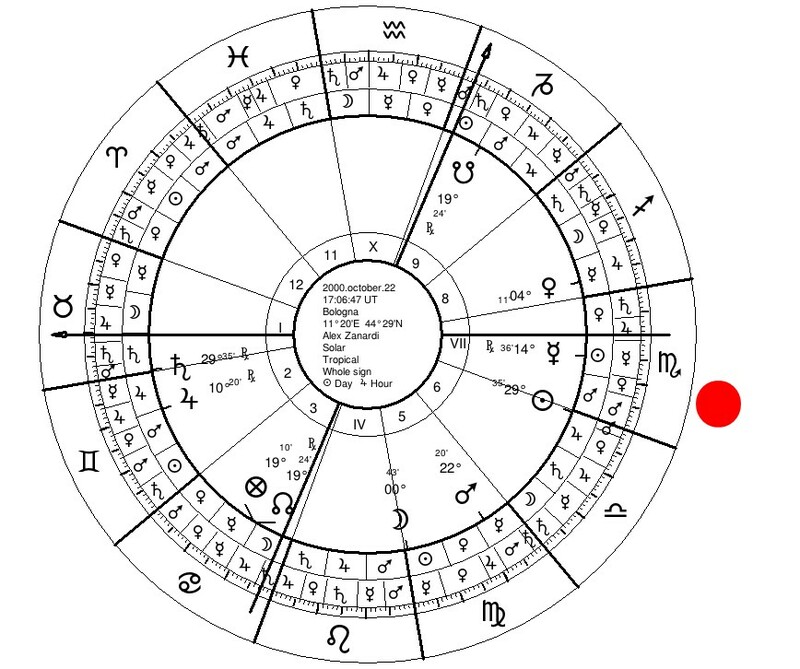 Mars is opposing Saturn, his physical body (L1) by sign while he also trines the AC. Daimon (Zanardi’s goals, his career) is conjunct Mars. Competition and race are his life. He cannot do without that. But his physical body (Fortune) is opposed by the ruler of the 8th house, the Sun. There is a price to pay. If we take the antiscia into consideration, we see further details. Saturn’s antiscion is in the 10th house and brings dysfunctional and possibly physical problems into his career. Mars contrantiscion is very close to Zanardi’s 10th house ruler, linking career with accidents. Zanardi was winning the American Memorial race at the German Lausitzring on October 15th, 2001 when he lost the control of his car. He was 34 years old and his 11th house was activated. Its ruler Mars, the malefic out of sect, became the ruler of the year. The position of the MC in this house shows his career to be challenged in this year. Furthermore, since Mercury is also in this house, this planet also becomes a key figure as we will see. 2001 is important for issues linked to illness (Mercury L6), and foreign countries (L9). Considering that Mars naturally rules accidents, this year was a critical one. In addition, we have to consider that Daimon is in Virgo, and thus also ruled by Mercury. In a certain sense we can imagine Fate offering Zanardi a choice: either to give up and waste his chance or head for other podium finishes. He did the latter. The annual profection just shows the major themes of the year, but still lacks a clear focus. Next, I will consider the bounds of the directed AC. The bound ruler will also play a fundamental role in this year, adding his nature. It may seem strange that the major benefic shows up in the year of such an horrendous accident. 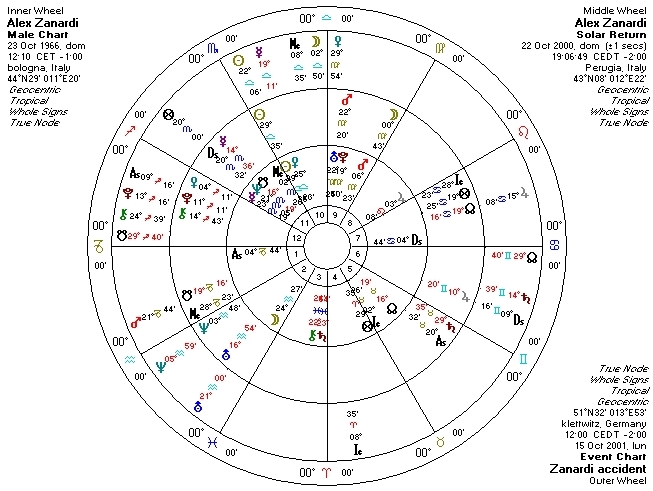 But if we read Zanardi’s chart, we see that luck (Jupiter, major benefic) comes through deep or near-death transformation (Jupiter in the 8th house). I will come back to this point at the end of this article. Next, I consider Zanardi’s solar revolution for 2000, which I use for the timing of the upcoming events, matching the topics of the annual profection, those of the bound ruler and the unfolding natal chart. The profected AC just opposes the AC of the solar revolution, challenging the body (1st house). In quadrant houses, the profected AC is in the 6th house of illness. In the solar revolution, Saturn is in the 1st house and Jupiter rules the 8th house of death, while the AC ruler of the Solar, Venus, is going to oppose Jupiter. However, both are benefics and Jupiter receives Venus in his domicile, triplicity (by night) and bound. This reception is probably the reason while he lost nearly all of his blood, but still survived. If we want to see when the Solar AC enters a new house, we can divide the solar year by 12 and assign one month to each house. However, this is just a very rough thumb rule. More precise timing is calculated using ascensional times. I cannot go into this method here, but just knowing that Zanardi’s 35th birthday occurred only 8 days after the accident, we understand that the directed Solar AC must have been in the 1st WSH (physical body) and 12th quadrant house. The latter is associated with accidents, hospitals and all kind of despair. Finally, we see, how the transits fit into the frame. Transit Mercury is combust in the exact degree of the Sun’s fall and linked to Jupiter, Saturn and Mars. 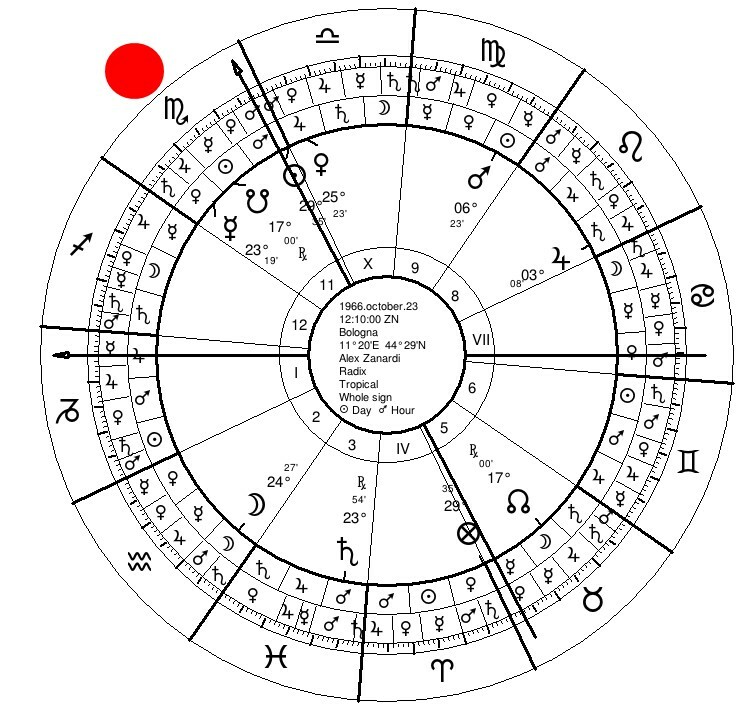 It is the planet in the profected AC (Mercury) which activates the LOY and the bound ruler at the day of the accident. The “stellar messenger” has indeed revealed to be a key figure in that particular year. In Zanardi’s chart we find Saturn (dysfunction, loss) in Pisces, which already compromises the feet. He is also in aversion to his own sign Aquarius. In the transits, Mars is in Capricorn and thus afflicts the knees, while his antiscion is in Sagittarius, involving the thighs. As we have seen, the Lord of the year (Mars), the planet in the profected AC (Mercury) and the bound ruler (Jupiter) are very prominent in this Solar revolution. While the Marsian part in the accident is self-evident, it might be less comprehensible, which role the major benefic played in this event. The accident was not a dark moment in my career. It was one of the brightest moments. Because I survived against every probability. According to science, I had not the slightest possibility to survive. All scientists without exception predicted my death. The books said that nobody could possibly survive similar injuries. The fact that I did not only survive, and had a came back, but that I stand where I am standing today, is not self-evident. It is fantastic. Indeed. This is Jupiter speaking out of the 8th house. From here on, the ruler of the house will be abbreviated in the following manner: L6: Lord of the 6th house, or L8, Lord of the 8th house etc. The luminary in sect is the Sun in a daytime chart (Sun above the horizon) and the Moon in a night time chart (Sun under the horizon). A contrantiscion is opposed to the antiscion. The malefic out of sect is Mars in a daytime chart and Saturn in a night time chart. After his accident, Zanardi was immediately brought to a German hospital, reflecting the importance of the foreign country and the link to an “illness”. His next solar revolution occurs shortly after his accident. Using ascensional times for Zanardi’s latitude, the directed Solar AC entered the 1st WSH on September 18th, 2001, less than a month a distance from his accident.